Ingredients: Aqua / Water, Cyclopentasiloxane, Glycerin, Butylene Glycol, Lactobacillus Ferment, Terminalia Sericea / Terminalia Sericea Extract, Triticu, Vulgare / Wheat Germ Extract, Perfluoroperhydrophenanthrene, Ginkgo Biloba / Ginkgo Biloba Leaf Extract, Caffeine, Magnesium Gluconate, Tocopheryl Acetate, Guanosine, Panthenol, Vitroscilla Germent, Methylsilanol Mannuronate, Sodium Hyaluronate, Prunus Armeniaca / Apricot Kernel Oil, Silica, Sodium Chloride, Dimethicone / Vinyl Dimethicone Crosspolymer, Dimethiconol, Dimethicone, C13-C14 Isoparaffin, Polyacrylamide, Laureth-7, Acrylates / C10-30 Alkyl Acrylate Crosspolymer, Triethanolamine, Methylparaben, Sodium Benzoate, Phenoxyethanol. 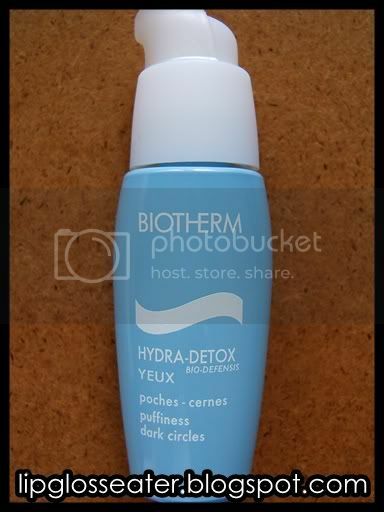 HYDRA-DETOX BIO-DEFENSIS Yeux is a fresh fluid gel with an innovative formula that offers a number of benefits. • A protective formula that helps the fine, fragile skin around the eyes protect itself from external aggression. • The detox complex is combined with active botanical ingredients selected for their power to fight dark circles and undereye bags (caffeine and ginkgo biloba). • A moisturizing complex (glycerin, panthenol, apricot kernel oil) to erase lines caused by dry skin. • Hyaluronic acid functions like a sponge that traps moisture on the surface of the skin to smooth wrinkles caused by dryness. • Pure Extract of Thermal Plankton to soothe the skin and stimulate its vital mechanisms. • Silicon to help maintain firmness. This eye gel spreads easily around your eyes! The scent is very very light (almost undetectable when you apply this product!). This eye gel comes in a pump bottle, which is great cuz it's hygenic and you can control the amount you dispense. The pump gets rather useless though when you're almost running out of product, but i'm glad that you can open the pump cap and scoop up some product with the pump tube! This product is priced at RM135 (approx uS$39.70), which i think is ok. It's available at all Biotherm counters and on Strawberrynet.com for US$44. I went to the Biotherm counter intending to get the Aquasource Yeux eye gel at first. The counter lady recommended this for my dark eye circles and puffy eye bags. Seeing that it's just RM15 extra from the Aquasource one, i got this instead! What a BIG MISTAKE!! i used this eyegel twice a day religiously for 5 months, and saw almost ZERO improvement - didn't diminish my eye bags / dark eye circles, it certainly didn't moisturize the eye area either -______- Pffffft!! To be fair, it did depuff my eyes a little (A LITTLE is the key word here)... but that effect lasted only a few hours before those Samsonites beneath my eyes started showing up again. What a total waste of money!! Does NOTHING. Period. Onto to skincare hall of shame wall this goes! 1 Star ! Absolutely Lousy product! !